Ownership / Access: Local community. Castle open to public. Notes: Whittington Castle is a castle in northern Shropshire, England, owned and managed by the Whittington Castle Preservation Fund. The castle was originally a motte and bailey castle, but this was replaced in the 13th century by one with buildings around a courtyard whose exterior wall was the curtain wall of the inner bailey. As a castle of the Welsh Marches, it was built on the border of Wales and England very close to the historic fort of Old Oswestry. 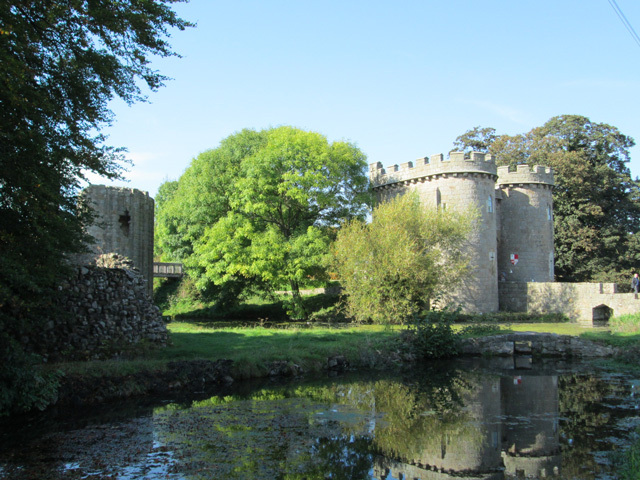 Whittington Castle resides on a 12-acre (49,000 m2) property in the village of Whittington, in the district of North Shropshire, in the county of Shropshire in England. It abuts Castle Road. In 2003, a historical and archaeological investigation by Peter Brown and Peter King identified that the outer bailey of the castle had been two elaborate gardens and surrounded by water in the 14th century. This discovery was significant in that it proved the advanced state (as compared to those of the French or Flemish) of English gardening habits. The "lavish" garden was installed by one of the FitzWarin family. The viewing mound in the centre may be the oldest of its type yet discovered in England..